Dave and I met a few years ago – and it’s been a bumpy ride ever since into true love. We’ve been through a three-state move, new jobs, a parent’s death and hurricane season in our adopted hometown of New Orleans. One of the reasons we love living in New Orleans is the sense of culture and history steeped in each corner of the city. So when Dave popped the question, we knew we didn’t want the trendy all-inclusive resortesque honeymoon. 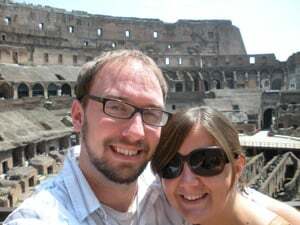 We figured that because we’re in our 30’s, we had one shot at the trip of our dreams before we settled down to save for a home and to start a family—so Italy was a no-brainer (I have a history degree and Dave loves “Roman Holiday”). Top to bottom, Italy was perfect for us: full of history, romance and adventure. We picked our honeymoon dates based on airfare—we carefully watched fare sales on Kayak.com and found an amazing itinerary into and out of Milan’s Malpensa Airport for $1700 roundtrip/person. So we started with that. We each packed one bag, and created a two-week itinerary reminiscent of the film “Planes, Trains and Automobiles.” We thought carefully about the cities we wanted to visit, how long we’d spend in each city and how to allocate our budget for hotels, sights, transportation and food. We walked a lot around Italy, but in doing so, we immersed ourselves more in the country’s incredible culture – and if you’re adventurous, it’s the way to go. 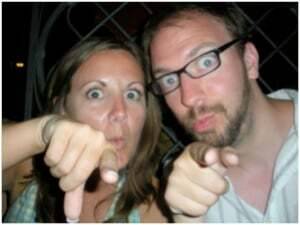 Armed with an Italian-English dictionary, our passports, outlet converters, extra camera memory cards and excitement, we set off for Italy two days after our wedding. Milan was a huge surprise to us – we’d heard it described as the fashion capital of Europe, and as the center of business in Italy – but it was surprisingly charming, especially when we ventured out to explore the city’s little visited canal district. One of the best meals we had in Italy was at Milan’s El Brellin, where we tried regional delicacies like trotter sausage. The next morning, refreshed, we took the train to Venice. We booked a gorgeous hotel in Venice, right on a lagoon off the city’s famed Grand Canal. We figured that we needed to pick a couple of cities where we’d splurge on nicer hotels—especially since we were effectively backpacking around Italy! And in Venice a romantic hotel is a must. 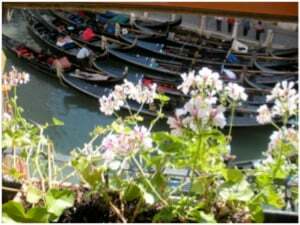 We walked around the city’s maze of bridges and canals and luxuriated in a gondola ride. The Doge’s Palace is immense, and while Venice is a little touristy, there is no place in the world quite like it. The city literally personifies romance. We traveled next to Bologna, where an elderly brother and sister, Carlo and Gabriella, taught us how to cook Bolognese dishes in Italy’s gastronomic capital. Bologna, which is Italy’s largest academic city, isn’t on a lot of travelers’ must-see lists – but it’s worth a trip for the food alone! On a sobering note, when our train first arrived in Bologna, we wondered at the cracks in the floor and wall of the terminal – until we realized they were a memorial to a terrorist bombing in 1980. From Bologna, we ventured into Tuscany. For three blazingly hot and sunny days, we explored the Uffizi and Acadaemia, as well as the Tuscan countryside. We saw Michelangelo’s David, were blown away by the Caravaggios in the Uffizi, and tried Florence’s infamous unsalted bread. During a war with neighboring Pisa, Florence was placed on a salt embargo – and to this very day, several centuries later, the city’s fierce pride demands that bread in restaurants still be made without salt. We crossed the river to visit the Ponte Vecchio and dance at a streetfair across the river from the city, near the Tivoli Gardens. We sampled Florence’s famed gelato and viewed the famed bronze doors at the unique Basilica di Santa Maria del Fiore. 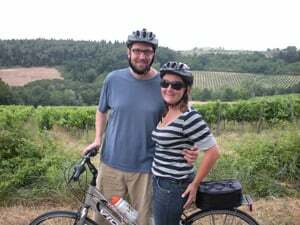 On a bike tour of the area, we visited a tenth century castle (Castello di Poppiano) still owned by the original family—and true to form as New Orleanians, we brought back several bottles of the castle’s well-known wines and olive oils. Florence was almost overwhelming – the city’s famed Dante is responsible for the dialect of Italian spoken across the country. Up next? Rome, of course! Rome was bustling, hot and incredible. From the front door of our tiny hotel we could see the massive Coliseum. We stayed close to the metro and the bulk of major Roman monuments, so that we could walk around the city and absorb ourselves in the city’s rich and intense culture. We ate dinner in Rome’s oldest synagogue, took communion in one of the city’s oldest Catholic churches and climbed up the Palantine Hill above the Roman Forum. We stared up at the oculus in the Pantheon and viewed Raphael’s tomb, and threw coins in the Trevi Fountain. We couldn’t get over the pomp and circumstance of the bright white marble Vittorio Emanuele II monument that lurches up in stark contrast to the rest of Rome’s common travertine buildings. One of the most amazing sights was easily the Sistine Chapel. It’s almost absurd how vividly breathtaking it is to see Michelangelo’s work. But by far the most amazing thing we did? 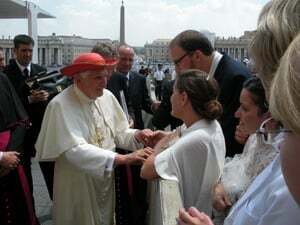 We received a nuptial blessing (a sposi novella) from Pope Benedict XVI! Of course, we had to stand in the blazing heat dress as a bride and groom for several hours, jockeying for position with newlyweds from Nigeria, Poland, Germany, Australia and the U.S. And really, you’ve never lived until you find yourself contemplating bodychecking someone in a wedding gown as they try to cut in line in front of you to meet the Holy Father. Despite the heat exhaustion, it still gives me chills to think that we – this unimportant couple from uptown New Orleans – had an opportunity to converse with the leader of the Catholic Church. The first week of our honeymoon had been so devoted to trains schedules and monuments that we chose to spend the second week at a bed-and-breakfast on the Amalfi Coast, in famed Positano. By the end of our time there, we never wanted to leave. From climbing the cliffside stairs down to the beach (Steinbeck once joked that to visit neighbors in Positano, you’d have to go up and down or side to side – and he wasn’t far off the mark) to taking the hydrofoil to visit Pompeii, the Amalfi Coast was almost painfully beautiful. We sat on the rocky beaches, explored the Blue Grotto and hobnobbed with couture-wearing socialites on Capri. In Positano, we were treated like family – from breakfast brought to our private terrace to laughter and singalongs in a restaurant overlooking the sea. We drank limoncello, bought brightly painted ceramics and most of all, relaxed and ready to tackle married life. We took one last lengthy train trip from Naples to Milan and flew home the next morning. We spent approximately $7,000 on our honeymoon, including airfare, train travel, accommodations and food/attractions. We packed light and committed the Italian train schedules and currency conversion rates to memory – but easily the smartest thing we did was to use the internet to book reservations at famed sights like The Last Supper, the Uffizi, Rome’s Jewish Ghetto and the Doge’s Palace. Doing so allowed us to skip lines and take our time enjoying the sights. By grouping some of the more intensive travel into one week, we were able to spend our second week just letting the fact that we were married (squee!) sink in as we held hands and walked through the storied streets of Positano. Best of all, we were able to leverage my iPhone, Twitter and Facebook to include our friends and family on what we were able to see and do – and for those who had participated in our honeymoon registry on Traveler’s Joy, it was meaningful to feel like they were part of our trip. And honestly? It was worth every penny. We still pinch ourselves on occasion when we think of the things we saw and did in Italy—in fact, we saved a bottle of prosecco we bought on the first day of our honeymoon for New Year’s Eve. As we toasted our new year, we realized that Audrey Hepburn never had it quite so good—and now we can’t wait for our next adventure.